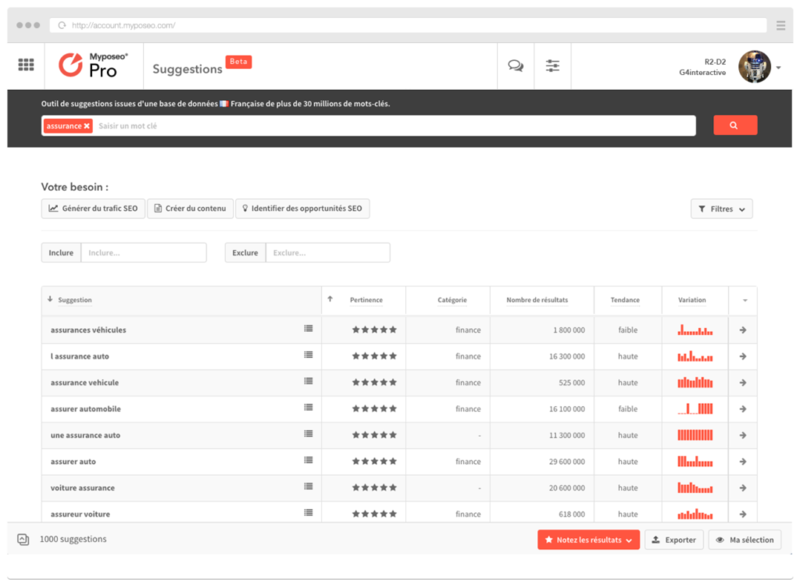 The Keywords Suggest tool allows you to quickly find new French keywords related to your searches. How does Keywords Suggest work? Access a huge database to search for your keywords! Type a keyword or phrase in the dedicated search bar. You can enter multiple keywords separated by commas. A list of expressions related to the keyword (s) tentered in the search bar is then proposed. You can then filter the list according to your needs. Select keywords according to criteria unique to Myposeo (pixel position, position above the fold, number of SEO, Adwords or universal search results, analysis of volume trends, volatility and difficulty of competition). Once you have selected your keywords, you can then create a list and export it to the format you want. Sign up for free and access to all SEO and PPC analysis tools, without credit card.